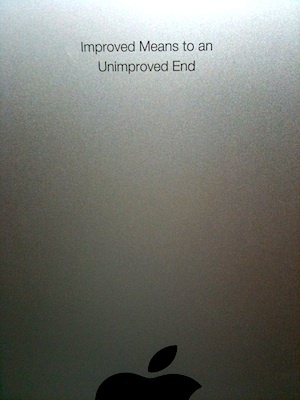 The real reason Apple offers free engraving is to weaken the secondary market. iP*ds are durable goods. Apple has a monopoly on iP*ds, but it still has to compete with the products of its former self. If people get tired of their iP*ds or decide they want to upgrade to a newer model, they can sell their devices to other consumers, who in turn are not giving their money to Apple. Who wants a weird engraving chosen by the previous owner on his iP*d? Who indeed? Buying something with the next sale in mind is not something I do. So, naturally, I ordered ours engraved. Would you buy this iPad, if it were for sale?